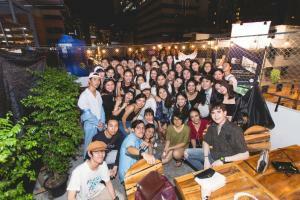 Homie Hostel & Cafe, set in Bangkok's Asoke area, offers both dormitory rooms and private rooms. Free WiFi is available. It is within a 10-minute walk from Terminal 21 Shopping Mall, Asoke BTS Skytrain Station and Sukhumvit MRT Station. Makkasan Airport Rail Link Station, with connections to Suvarnabhumi International Airport is a 15-minute walk away. Restaurants, bars and shops can be found near the hostel. All rooms come with air-conditioning. Individual bunk beds come with a personal reading light, an electrical socket, a small basket for holding belongings and a privacy curtain. Private rooms have a flat-screen TV. All guests have access to shared bathroom facilities. Homie Hostel & Cafe has a 24-hour reception and lockers are available. For stays of 14 nights or more, the property requires a 100% prepayment via PayPal. Guests will receive a direct email from the property with further instructions. To confirm the reservation, payment must be made within 48 hours once email is received. Payment before arrival via bank transfer is required. The property will contact you after you book to provide instructions. A damage deposit of THB 300 is required on arrival. This will be collected as a cash payment. You should be reimbursed on check-out. Your deposit will be refunded in full in cash, subject to an inspection of the property. Rate: THB 320.00 ... THB 3300.00; select dates below to get current rates.